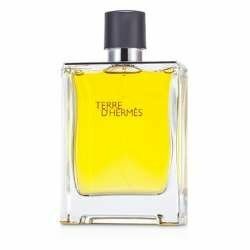 Hermes Terre D'Hermes Pure Parfum Spray is Launched in 2009. A woody chypre fragrance for men, Deep, earthy, smoky & balanced, Top notes are grapefruit & orange, Base notes are woodsy notes, oak moss & benzoin. Perfect for all occasions. This vertically structured scent is based on an alchemy of wood, the scent first introduces the gaiety of orange and the vivacity of pepper and of fresh spices. This “vegetality” flirts with the mineral effect of flint and the coarseness of vetiver.